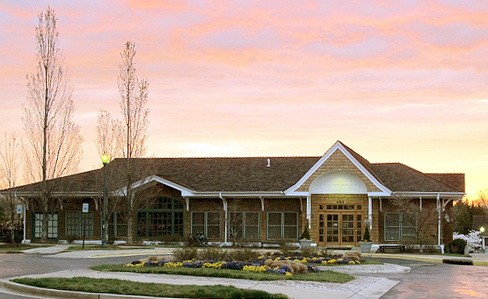 This project is a recreation center for the new Duany/Plater-Zyberk town, Kentlands, in Maryland. The program is for 40,000 square feet of buildings which include a restaurant, recreational pool, junior olympic pool, tennis courts with an exhibition stadium, ballroom and adjacent meeting rooms, and guest lodging. The project provides an opportunity to create an important neighborhood landmark which relates properly to the urban fabric and scale of its neighboring buildings. In this project, too, local architectural vernacular has been studied and Marylands own charming architectural vocabulary is being used. Terminating the major avenue of the town, our design includes three public pools, four tennis courts, numerous other recreational facilities and an inviting shingle style swimming facility building on 4 acres of sloping naturalized landscape. The swimming facility building straddles a ten foot drop in grade afforded by the existing slope of the site, making it one story on the entrance side and two stories at the pool side. 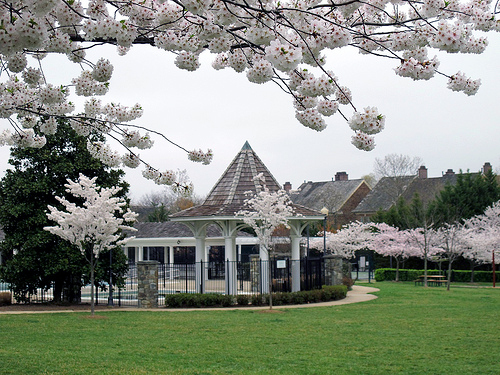 The perimeter of the Kentlands Swimming Facility encourages walkability and sociability. Amongst the naturalized landscape, partly concealed meandering walks weave in and out of gardens and garden structures, unveiling discoveries, “secret rooms” and little hide-a-ways all along their length. The design of the swimming facility harkens to graceful architectural styles at the turn of the century. The porches hang a story off the ground, and seem buoyed by the lush gardens below and glimpsed vignettes of youth in pleasured sport. Though graceful at a glance, the building is also very practical in its designed flexibility. Upstairs a luncheon grill serves a sunny dining area, which can also be used for dancing and get-togethers in the evenings. In addition a variety of adaptable rooms serve large and small groups comfortably at the same time for anything from slide presentations to intimate bridge games. Downstairs at the pool level are the male and female locker rooms and a complete fitness center.